A Crest (紋章 Monshou) is an item used to aid in evolution. 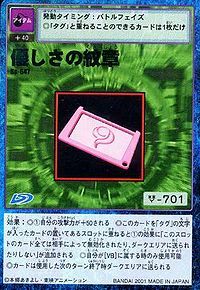 In the Digimon Adventure continuity, when used in conjunction with a Tag and activated by their owner exemplifying the trait embodied by the Crest in question, they allow a Partner Digimon to super-evolve to the Perfect level. 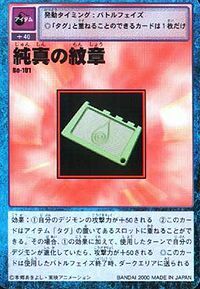 Eight of the nine Crests were created by Gennai's group specifically for their respective Chosen Child, alongside the Digivices, Tags and their Partner Digimon. However, the Dark Masters caught onto the plan and broke into their facility, killing all of the inhabitants save Gennai himself and absconding with the Tags and Crests. The Crests were then hidden across the Server Continent, with the Crests of Love and Light eventually ending up in the possession of Nanomon and Vamdemon respectively. Some time later, the Chosen Children were sent to Server to reclaim their Crests, successfully gathering all but the Crest of Light during the conflict with Etemon, and first activating them one-by-one during their efforts to stop Vamdemon. Vamdemon later used the Crest of Light to try and track down its bearer, the "eighth child" prophecised to kill him, but it was stolen from him by Wizarmon and returned to Yagami Hikari who, just as the prophecy dictated, used it to evolve Tailmon to Angewomon and kill him. The eight Crests were destroyed by Apocalymon, but the Chosen had by that point passed the need for them in physical form, now embodying their full power within themselves. In May 2000, the Chosen returned briefly to the Digital World to surrender said power in order to free the Four Holy Beasts from their imprisonment at the hands of the Dark Masters, thus removing their ability to super-evolve their partner Digimon. This page was last modified on 5 November 2014, at 07:55.